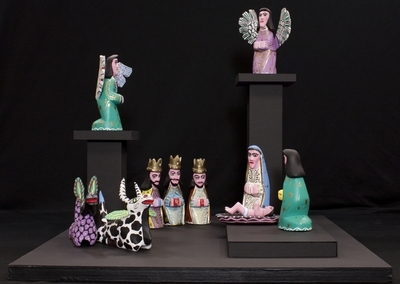 Handcarved and handpainted wood figures created by Juan Melchor Ojeda in Oaxaca, Mexico, depicting the nativity of Jesus. The exact date of creation is unknown. Exhibition label originally written by Fr. Johann G. Roten, S.M. for exhibit held at Roesch Library, University of Dayton.